Training | Move fast. Think slow. 12 hours in 3 days: Grumpy but not too Grumpy! Every so often at strategically timed intervals, which come around again amazingly fast, Coach Cal puts our triathlon training group through a short volume push. For myself, it is putting close to the same number of hours I usually train in a week into three days. 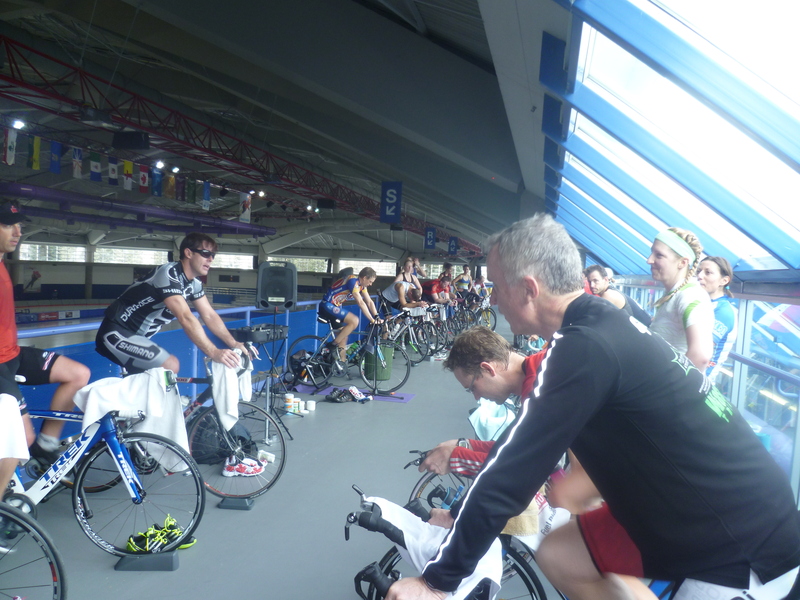 On Friday we started the weekend with a group video ride at the Olympic Oval. While most of the group did some epic vertical snowshoeing near Banff on Saturday, I opted to stay home and cross-country ski at COP, swim, and trail run in order to get more family time and not be gone all day – sometimes I’ve found I have to find the best alternative options to keep my personal athlete-mom balance in check and still get in the necessary training! 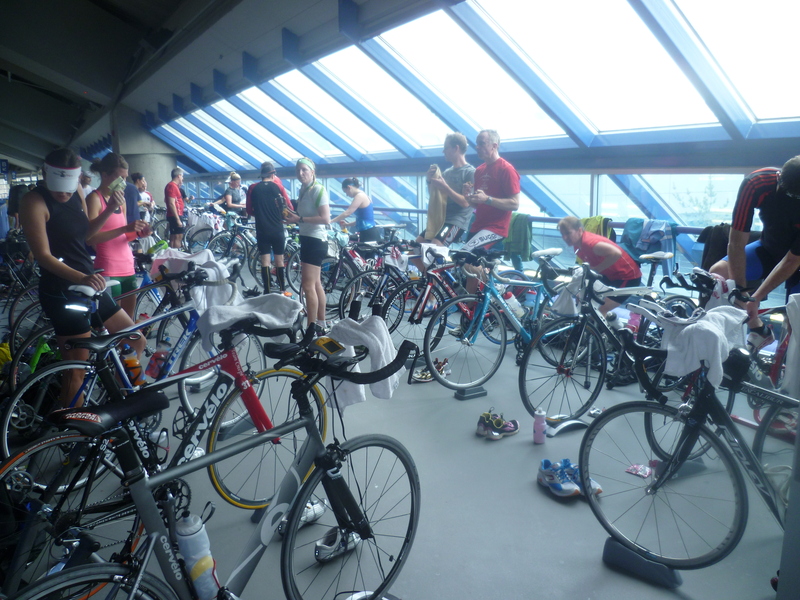 Sunday we finished the weekend off with an epic 5-hour Brick back at the Olympic Oval – a final test of mental and physical endurance mixed up with bike sets, running, stairs, and swim band pulls. The weekend got me thinking about how physical and mental endurance builds in increments, and that I am way better at handling training volume than I was when I first switched to being a cyclist and then a triathlete. Since I’ve spent half of my racing career so far specializing in the 1500m run on the track, I remember thinking a 90 minute bike ride was long when I started mountain biking while injured one summer. After about my third mountain bike race that same summer at Nationals in Ottawa, I couldn’t believe my brother had the energy to go out on the town with friends, while I was so wasted tired! When Coach Cal first told me to run 2h and then 2h30 at one time, I thought that was nuts, the longest I’d done as a pure track runner was about 80 minutes! Or to run zillions of mile repeats as fast as we could go! Or when I had to do my first ride longer than 4 hours. what ride for 5-6 hours, that is crazy? !…still a rare occurence but now I know I can do it! Or gradually building up swim mileage and speed in the pool, or even to race a half marathon, and then half-ironman, nuts and too crazy hard…but of course I got to thinking each time maybe I’ll try it…and so on. Though I still think of doing an Ironman as a little crazy, ha, I’m not there yet! As our bodies learn to handle more training over time, we learn how to better mentally embrace it, prepare for it, and have strategies for how to get through it. The same for mental intensity. As on a typical Tuesday night last week, we finished a long night of speed work on the track, and I was done like dinner at the end, but somehow finding the mental focus to get through it has become easier over time with practice, I’m better at just breaking it down to focusing on one interval at a time! 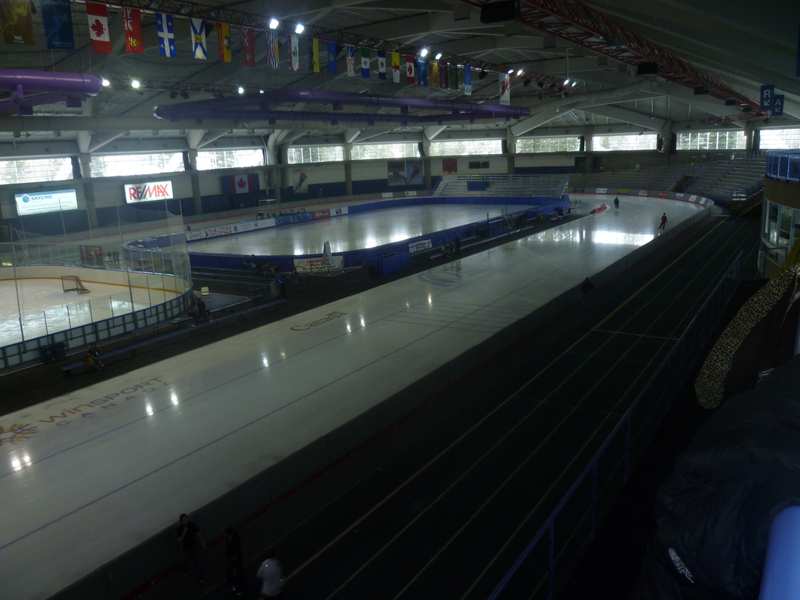 The Olympic Oval with a running track around the outside of the Long Track ice, perfect for indoor winter track sessions, and Bricks with plenty of stairs to up the hurt factor! And now I can finish a weekend like this and not be too much of grumpalufagus with the family, and even have a little energy left over each day to enjoy and play with my kids – not like I have a choice on that matter anyway – ha! And of course, I always like to reward some solid training with a little sweet treat – today it was quinoa chocolate cake – try this somewhat healthy one for some good protein recovery…:) It was a hit with my entire famille ce soir! Bring 2/3 cup quinoa, 1 and 1/3 cup water to boil, simmer for 10 minutes, turn off heat and leave to cool. Combine 1/3 cup milk, 4 large eggs, 1 tsp vanilla extract in a blender or food processor. Add 2 cups of the cooked quinoa and 3/4 cup melted butter and continue to blend until smooth. Whisk together 1 and 1/2 cups white or cane sugar, 1 cup cocoa, 1 and 1/2 tsp baking powder, 1/2 tsp or baking soda, and 1/2 tsp salt. Add to blender and mix well. Divide batter into two 8-inch, greased pans and bake at 350 for 40-45 minutes. Well, if there is one thing you learn after childbirth, when you get exercising again, it is how much you use all those small core muscles to stabilize everything! After both kids were born, when I first started running again it felt like I was running with a jelly belly! It took at least six months each time until I felt everything was holding together solidly again when running, especially during speed work! And if you’re not strong from the core, it can lead to a bodily chain reaction of nagging pains or injuries in other areas. I came back quicker than ever after having my son and suffered some achilles problems for a bit as a consequence of a weakened core. Every season, I have intentions of doing more core work as it is the foundation to having proper technique, strength, power and stamina in any sport. I realized this importance while mountain biking in the early months after having Nico as well, my back was often sore as it was doing all the work to stabilize me on the bike! While I had a good start to regular core work as I began my winter training recently, as I write this I have fallen off the core wagon again! Unless I count all the box lifting I’ve done while moving houses the past week – and that’s my time excuse too, ha! My goal is to do regular core work 2-3 times per week for a minimum of 15 minutes. It doesn’t sound like much and as important as I recognize it to be, when the business of life and training sets in, and when I’m healthy and taking being injury-free for granted, core work is unfortunately the first thing to get dropped from my schedule. Oh, did I say schedule? Part of getting it done would be to put it in my schedule to start with! I’ve always liked the ring of “implementation intentions” an academic term related to the research of effective goal setting that means going beyond having the goal (or intention) to do something and planning the steps for how you will implement it – to consider where you will do it, how you will do it, when you will do it, with whom you will do it etc. 1. Swiss Ball Exercises. Coach (brother) Geoff put me on this program when I first started mountain biking. I do 10-20 repetitions of sit ups, right and left side sit ups (is this the right term? ), back extensions, hamstring curls, and ball roll ups (from plank position with hands on the floor bring your knees up into your chest with the ball under the top of your feet) continuously rotating through each exercise for 10-15 minutes. Or build up to 45 minutes for a real trunk stamina challenge! 2. P90X. I’ve never been a huge fan of exercise DVD’s but my dad got into P90X and introduced it to me in the summer. The guy (Tony) is motivating and not annoying to listen to. Every exercise has a countdown timer too. My two favourites are Ab Ripper X, a solid and tough 15 minute core routine or if you have more time, the core synergistics workout is a good one that involves more dynamic and functional work with light weights and bands. 3. The Timer Mix. I set my watch to beep every minute and just rotate through any core exercises I can think for 10-15 minutes or more. Using a combination of ab work, planks, push-ups, side leg lifts, arm and leg work with resistance bands, the time goes by amazingly fast. 5. Pilates. Not one of my faves because I’ve yet to try it but I must add it to the list as I’ve heard this is a great workout for core strength! Forty years ago this summer, my parents discovered Hornby Island, a northern gulf island in British Columbia, and bought some waterfront property overlooking a sandstone beach. After ten years of camping, my parents built our family cabin in 1981, which they have expanded and renovated over the years. With it being only an hour trip, which includes two 10-minute ferry rides from where I grew up in Courtenay, B.C., it has been the ideal weekend and summer vacation get-a-way for our family, and now my parents live here most months during the warm half of the year. Here is how the cabin looks today looking up from the water…..
Zoe and Nico enjoying dinner with a view! When we want a break from the rocky, sandstone beach there are three incredible sandy beaches to visit. Here I am at the largest one, Tribune Bay, getting in for an open water swim. The water is crystal clear and it takes me 25 minutes to cross the bay and back at high tide! Ironically spelled the same way as my brother’s name, Mt Geoffrey Nature Park has some of the most fun single track trails to mountain bike and run on. I can ride trails for over 4 hours without getting bored on Hornby. There are some incredible views and the flowing single track is so pretty, lined with salal bushes, ferns, beautiful green moss and big B.C. fir trees! The trails are all well-signed and maintained, and there are no bear or cougar worries here either! Nico outside “Fibres” where you can find everything hippy and bohemian for Island life! Swollen hands and face, itchy scalp, worsening exercise-induced asthma, heartburn, indigestion, feeling empty, breaking out in itchy hives, severely decreased motivation and general grumpiness! These were the symptoms I experienced all at once at my worst. It was the spring of 2005 and my first full season racing Xterra triathlons after focusing on mountain bike racing the previous five years. I found myself so under recovered that it took me a few months to feel normal and get that snappy feeling back in the legs. Without a serious triathlon coach to help me balance the three disciplines I had not backed off on the cycling much and just added some running and swimming – not such a good idea! I was also finishing my PhD thesis that spring on top of learning a new sport and traveling to many new race venues all over the U.S.. It was all exciting and positive, but when all added together stressful nonetheless. After consulting with a local doctor in Canmore where I was living, who had worked with many athletes, he reassured me that most of my symptoms were likely due to being under recovered. Even though I wasn’t allergic to anything, our bodies sometimes act like it is an allergy and produce extra antihistamines in response to too much stress. I learned my lesson that season. The following season I found my current coach, Cal Zaryski, who races Xterra himself and is excellent at personalizing my training in accordance with what else I have going on in life with work and family. Once in awhile a few of the above symptoms come back and I take it as a warning to monitor myself and listen to my body. Of course, if its just a day or two after a hard block of training that is normal, or after a hard race, when it can take a couple of days to refuel the tank, physically and emotionally. As a mother, it has been even more important to listen to my body. Staying healthy is number one, so once in awhile if I feel I’m on the edge of getting sick I back it off. I remember when my brother Geoff coached me as a mountain bike racer, he always said, there is no harm in throwing a day out now and then. So if I miss a planned day of training once in awhile I don’t sweat it. Recovery activities like massage, ice baths, stretching, yoga or using the foam roller don’t happen as often as I’d like but I just have to go with the flow. Luckily I’ve also learned through the sleep deprivation days with babies that I can still have good energy with less sleep and that exercising and training gives me extra energy. Like most athletes, if I’m overdoing it I get testy and impatient and so my kids and husband usually are my first alert to when more rest is needed. Overall, I try to follow my own advice to the athletes I work with and rely on good self-awareness. Sometimes it takes some trial and error to know how much training you can handle in a given week while trying to balance other things like school, work and/or family. When I first started cycling I relied a lot on monitoring tools like heart rate (in training and in the morning) and watts but with time I’ve been able to go more by feel. Most people forget that it is not just the training intensity of training volume that contributes to over training or under recovery, other life stress can be just as much a factor so balancing it all week to week can be an ongoing learning process. I’ve learned how much volume I can handle while working part-time and raising two little sweethearts, and it is likely almost half the training that some of my competitors who are full time athletes do, but the exciting part is seeing what I can do with the time I have to do it in! As I sit here still feeling pretty beat up from three days of mountain bike racing in Fernie, I take it day by day and my body will tell me when it is GO time again!